Within two hours of President John F. Kennedy's assassination, police had gathered suspects from around the Dallas area. During the chaotic scene, CBS News cameras showed one unidentified man in handcuffs at Dallas Police Headquarters. He would later be identified as Lee Harvey Oswald. Oswald had initially been arrested not for the Kennedy assassination but for fatally shooting a Dallas police officer named J. D. Tippit. Oswald, who was stopped by Tippit in the Oak Cliff neighborhood of Dallas about 45 minutes after the president was killed, shot the police officer at point blank range. Thirty minutes later, Oswald was apprehended with a .38 caliber revolver at a nearby movie theater. The weapon was later tied by ballistics to the shooting of Tippit. When Oswald was brought in to police headquarters, there were officers there taking affidavits from employees of the Texas School Book Depository. One of them recognized Oswald as he was led by – that's when police knew they likely had the man who not only killed Tippit but also the president. CBS News' Walter Cronkite went on air: "We reported to you on the arrest of that individual in Dallas. He is being grilled now. He is said to be 24-years-old. The name has been given for him by Dallas Police as Leo H. Oswald." The case against Oswald was mounting. Dallas Police Chief Jesse Curry told reporters that Oswald's paraffin test was positive, showing that he had fired a gun recently. TV news cameras showed police parade the gun that Oswald allegedly used to kill the president – a high-powered military rifle. Oswald was formally charged with assassinating President Kennedy. The slightly built former Marine said he was not allowed legal representation and he pleaded ignorance when confronted by a throng of reporters at the police headquarters. "I really don't know what this situation is about. Nobody has told me anything except I'm accused of, uh, murdering a policeman," Oswald said. When asked if he had killed the president, Oswald replied: "No, I have not been charged with that. In fact nobody has said that to me yet. The first thing I heard about it was when the newspaper reporters in the hall asked me that question." Who is Lee Harvey Oswald? Soon after the arrest, a portrait of Kennedy's accused assassin began to emerge. Born in New Orleans, Oswald's family moved to Fort Worth, Texas, and then New York before resettling in the Crescent City. Oswald gained a reputation as a poor student who often got into trouble. His high school classmates told CBS News that Oswald was a "bookworm" who kept to himself. "He was an oddball," said one former classmate. "He didn’t mix with other kids in school." But Edward Voebel, one of Oswald's few known friends, offered another perspective: "I liked him because he wasn’t run of the mill." At age 17, Oswald quit school to join the Marines. In 1956 he ranked as a sharpshooter in scoring with an M-1 rifle but three years later he was court-martialed and demoted for accidentally shooting himself with an unauthorized gun and for fighting with a fellow soldier. An examination of Oswald's personnel records reveals a letter he wrote to the secretary of the Navy in which he vowed to “employ all means” to right the wrongs of his undesirable discharge from the Marines. A self-described Marxist, Oswald defected to the Soviet Union in 1959, married and returned with his Russian wife, Marina, to the U.S. in 1962. He eventually got a job at the Texas School Book Depository in October of 1963. The next month, he was the most infamous suspect in the history of the Unites States. CBS News' Dan Rather reported after Oswald's arrest: "The man is 24-year-old Lee Oswald, espouser of leftist causes, an active member of the Fair Play for Cuba Committee, an avowed admirer of Russia and of Cuba's Fidel Castro, a man who once lived in Russia." On that Sunday, Nov. 24, 1963, the plan was to take Oswald from the Dallas Police Headquarters where he had been questioned and detained, and transfer him to the county jail. "The Dallas police were extremely worried for the safety of their prisoner," recalled KRLD radio reporter Bob Huffaker, who was there. "We knew that Oswald was the most hated suspect of the 20th century." Oswald never made it to the county jail. A Dallas-area nightclub owner named Jack Ruby rushed the suspect and fired a small-caliber pistol into Oswald's stomach at point-blank range. CBS News' Harry Reasoner reported that Ruby was handing out cards offering free drinks to reporters just a few days prior. 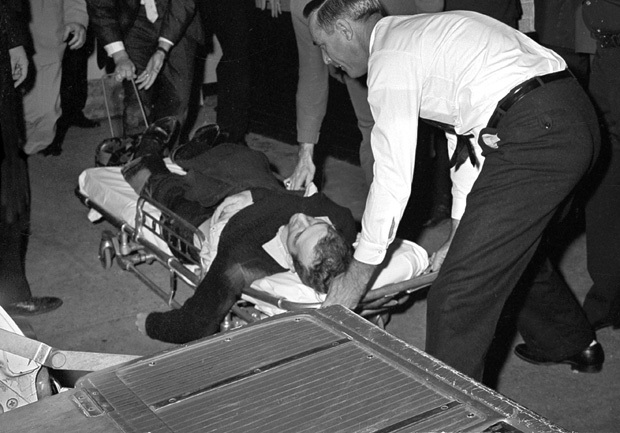 Moments after the shooting, Oswald was hurried into an ambulance as a crowd of reporters circled the area. Reported Huffaker: "Here comes Oswald, he, he is ashen and unconscious ... and now the ambulance is coming out... the ambulance with Lee Harvey Oswald who was shot." He was taken to Parkland Hospital and died in an emergency room just 10 feet from the room where President Kennedy had died two days before. Rather: "Keep your eye on the man in that hat"
Aided by slow motion video, CBS News' Dan Rather offered a play-by-play account of Ruby's attack on Oswald. "Keep your eye on the man in that hat," Rather told viewers as Ruby's figure entered the frame. It didn't take long for conspiracy theories to emerge about the death of Oswald. As Walter Cronkite reported, the Communist press said that Oswald was "killed to shut his mouth." Since November 1963, rumors that Oswald had received aid in a conspiracy to kill President Kennedy have been rampant. Over the years, a wide range of notable figures have been linked to the assassination - from Cuban President Fidel Castro to Vice President Lyndon Johnson to FBI Director J. Edgar Hoover. Doubts about the "lone gunman theory" led to the Warren Commission, whose findings in 1964 stated that there was no evidence "of any conspiracy, domestic or foreign, to assassinate President Kennedy," and that Oswald had acted alone in the shooting. However, in 1978, the U.S. House of Representatives Select Committee on Assassinations concluded that Kennedy was likely killed as a result of a conspiracy.